Yes, it’s on the way… How do we know? Click here. It’s pretty obvious. Well that and the fact that SAAMI has published the specifications already. The same print from SAAMI comments that a 32 grain bullet will go 4100 feet per second (fps). Like the 22 Nosler the 20 is based on the 6.8 SPC case or 30 Remington depending on how you view it. They both have rebated rims so as to fit in a standard AR-15 Bolt face. The 20 Nosler will have about eight (8) percent more case capacity by water weight than the 204 Ruger. So is the velocity claim of 4100 fps realistic? On Nosler’s own pages they show the 204 Ruger doing that velocity with the same bullet, so I would say, sure, it just means you will have short barrel life if you load to that level. It’s long been know that velocities approaching 4000 fps are hard on barrels, the throat is erodes much more quickly regardless of the bullet diameter. I foresee the barrels for this caliber being chrome washed or Melonite® teated simply to increase barrel life. The 20 Nosler might have some loading flexibility that the 204 does not in that if you loading for 3500 to 3800 fps there are probably a few more powders that will get there with the larger case capacity. One thing I noticed in looking for comparisons, the 20 Nosler falls in its own class in terms of case capacity, the 20 BR has just a couple of grains less capacity, but it’s not designed for the AR platform. The other popular wildcats in this general class either have a fair amount less capacity, or a lot more. If for no other reason, this cartridge will have a following just based on the case capacity. There is certainly no doubt, this will be a flat shooting varmint cartridge that will do the job in the dog town or out taking coyotes. Nosler™ is a trademark of Nosler Inc. Most likely Nosler will release this cartridge at SHOT Show 2018. Watch for updates here. The subject of 223 Remington vs. 5.56×45 (5.56 Nato) is a popular source of discussion. One item this and most of the discussions seem to overlook is headspace. Since this blog leans more toward gunsmithing subjects, I wanted make sure this subject was discussed. I often hear from clients that the 5.56 and the 223 differ in headspace. The truth is, when I checked the various gauge makers they are all working to the same standard. Mainly because educating the shooting public minimizes accidents and makes life easier for all concerned. None of the articles I looked at mentioned headspace. Most of the chamber dimensions being shared do not include headspace dimensions. This may be in part because they are so hard to locate for the 5.56 Nato. 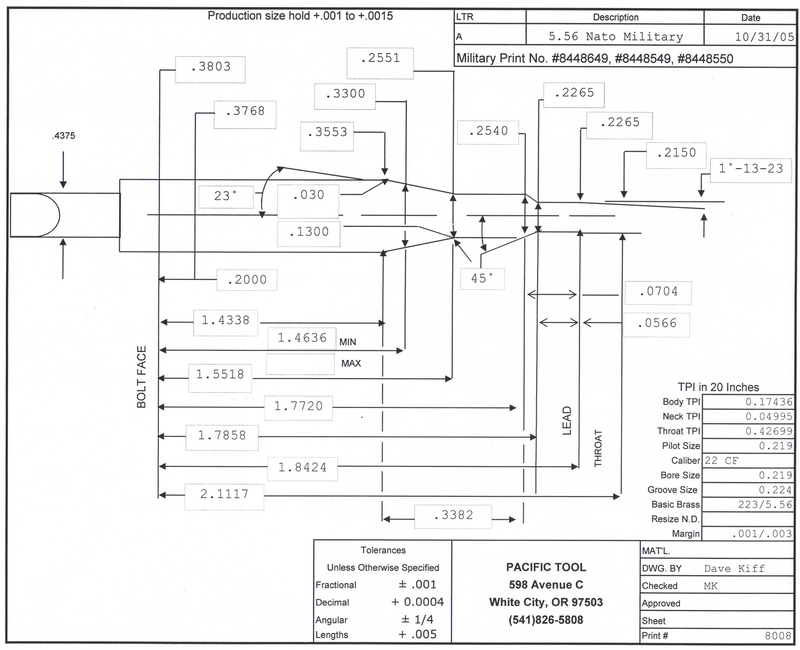 Forster Products publishes the data for their 5.56 gauges. Minimum headspace (Go gauge) is 1.4636” according to their specifications with a tolerance of -.0003”. With the Maximum (Field gauge) measuring 1.4736”; that’s 10/1000s of an inch longer than the go gauge. Most No-go gauges would be set .004” to .006” longer than the Go gauge. The Pacific Tool & Gauge print shown here uses a Go gauge that measures 1.4636”. Look at the Minimum Headspace dimension listed on this print, it is identical to the dimension used on the 223 Remington. SAAMI specifications for the 223 Remington show a Minimum headspace (Go gauge) of 1.4636” identical to the military spec for the 5.56×45. The Nato round is not a SAAMI cartridge, so they do not provide prints or specification for it. My curiosity as to why so many shooters think there is a difference between the gauges for these two, led me to do an Internet search to see what people are reading. I consider all material on the Internet to be of dubious quality until I can confirm the data through trustworthy sources. What I found was interesting; you have to dig deep to find anything that pertains to headspace and the 5.56 Nato. What is easy to locate are drawings which purport to show why the two cartridges are not the same. The dimensions they are concerned with mostly have to do with the junction of the body and shoulder plus the shoulder and neck. In the real world the camming action of the bolt closing would be more than sufficient to deal with the tiny difference that might exist in the brass. Frankly there is more variation in tolerances allowed that these drawings account for, in short, it’s all smoke and mirrors. One Internet source shows the Military gauge .001” longer than is found in the prints mentioned above. Even if that were the case, that is only 1/5th of the difference between a standard Go and No-go gauge for the 223 Remington. To be totally clear, it would make NO difference. Conclusion: Headspace gauges for the 223 Remington and the 5.56 Nato are identical. The differences between the cartridges has to do with case wall thickness and how they are loaded. If you want to shoot either type of ammo in your gun, rechamber it to 223 Wylde. The Wylde chamber is designed to work safely with both types of ammo. We reported on this gun when Miller Precision first introduced it on July 4th,2012. 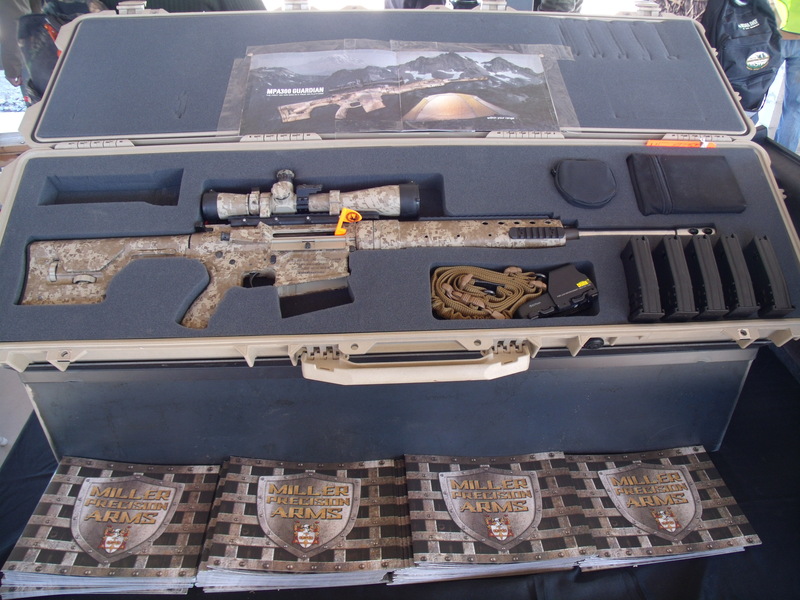 More recently they displayed the MPA300 at the SHOT Show, 2014. At Media Day they had several rifles there ready for writers to test. Not too surprising, the writers all wanted to shoot the 300 Winchester in favor of the other models in 308 Winchester and 5.56 Nato. The MPA300 has the distinction of being the only 300 Winchester Semi-auto on the market that is truly on the AR platform. While the upper, lower, magazine and bolt carrier are specific to the MPA, the rest of the parts are all AR-10 interchangeable. So you can dress your gun with any of the various features that are already on the market for the AR-10. Media day turned out to be a real endurance test for the MPA300. When Brandon Miller saw that everyone wanted to shoot the 300 Winchester almost exclusively, he decided to see how long the gun would run without a cleaning. It went about 2700 rounds before the first malfunction. A quick inspection and cleaning had the gun back at the line and by the time the smoke cleared the gun had fired over 4000 rounds without a second failure. Actions are machined from billet aluminum. These guys are selling quality, not big-box store discount products. Finishes for the Miller Precision guns are about as varied as you can ask for. Among other things they offer hydrographic coatings, so the choices are almost limitless. These guns are impressive. Mossberg is offering five new models in their MVP line. Calibers include 5.56mm and 300 AAC Blackout. Barrels are 16.25″ long, medium bull contour, A2 flash hiders are installed. The Trigger is the Mossberg LAB adjustable type. This handy package is popular with anybody who hunts in a brushy or timbered area that makes a long barrel a pain to maneuver. Ranch hands and farmers will be attracted to the convenience provided by the compact size. That coupled with the AR magazines make this a rugged work horse of a rifle. Mossberg is also offering six new variations on this rifle in their “MVP Flex” rifles. Lots to choose from. Gunsmiths are always looking for sources for quality barrels. There are several good makers in the United States. Douglas, Hart, Krieger and Pac-Nor to name a few. Bergara is a Spanish barrel maker. They recently purchased new equipment that have allowed them to expand operations both in Spain and the U.S.
Shooters of the T.C. Encore™ have probably heard of Bergara Barrels, because they manufacture replacement barrels for the famous Encore™ pistols and rifles. Accuracy reports from these barrels have been very good. Of late Bergara USA is offering much more, including tapered barrel blanks for gunsmiths. Prices are comparable to other barrels in the marketplace. The video below is an introduction to the manufacturing processes used by Bergara to make barrels. Pretty interesting if you have never seen a barrel made. Bergara has invested in some new high-tech gun drills and equipment to manufacture quality barrels in a less labor intensive process. The newest addition to the NRA Gunsmithing Schools is at Flathead Valley Community College in Kalispell, Montana. This school is being ramrodded by Brandon Miller, who ran the NRA School for Murray State College in Oklahoma for a while. So, you have experienced management and the instructors are very experienced as well, with a wide variety of expertise. Everything from Basic Gun Safety, to machine shop, glass bedding rifles, and classes on the 1911. Much more is listed in the brochure which you can download from the web site linked below. These short term classes allow professionals to take a little time off from business to expand their abilities, or for the hobbyist its a great way to learn the specifics your interested in. Either way its a convenient way to learn with classes normally running for 5 days or less. Check out the list of Classes being offered at FVCC this summer at this link. I just talked to the staff at the college, and as of today there is still room in many of the classes. Take a vacation and have some fun. Eastern Sports and Outdoor Show Cancelled. Reed Exhibitions has decided to “postpone” the 2013 Eastern Sports and Outdoor Show. Postponed is really code for cancelled, this show will not take place in 2013. Reed Exhibitions’ announced several days ago that modern sporting rifles (i.e. AR-15 and all variants) and high capacity magazines would be prohibited from the Eastern Sports and Outdoor Show. The leadership of the National Shooting Sports Foundation (NSSF) has been in intense, frank discussions with Reed Exhibitions management in an effort to reverse this unacceptable decision. These discussions reached an impasse. NSSF is in no way affiliated with, nor does it participate in or exhibit at the Eastern Sports and Outdoor Show in any way. However, Reed Exhibitions does manage the NSSF-owned SHOT Show (though Reed manages the SHOT Show, all SHOT Show decisions, policies and actions are made at NSSF’s direction). Watch for that relationship to end soon. This successful boycott, began on the website mynortheastoutdoors.com. It’s the best demonstration of support by the outdoors industry yet against gun control efforts being pushed in Washington and in several states. Reed Exhibitions has taken a position that is clearly in opposition to the exercise of 2nd Amendment rights. The Eastern Sports and Outdoor Show was scheduled for February 2nd to the 10th , 2013, in Harrisburg, PA.
“In the current climate, we felt that the presence of Modern Sporting Rifles would distract from the theme of hunting and fishing, disrupting the broader experience of our guests. This was intended simply as a product decision, of the type event organizers need to make every day. 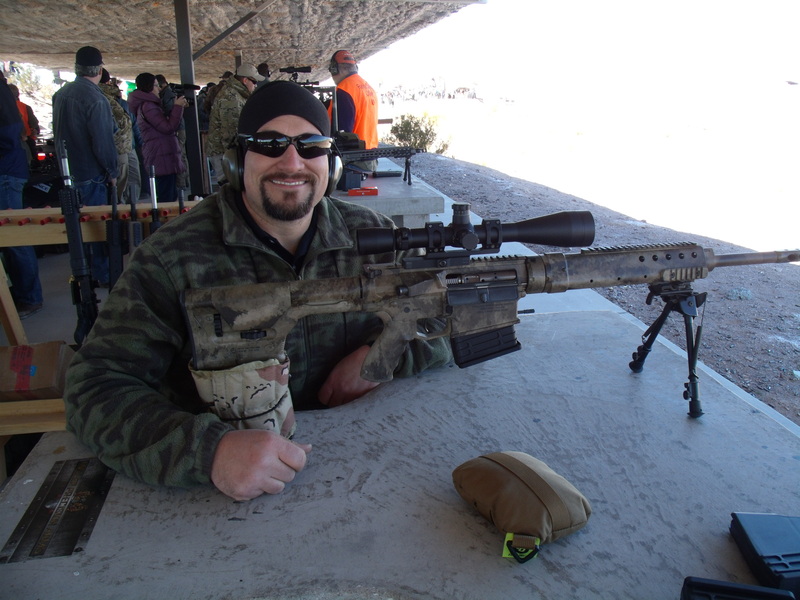 In light of the fact that about thirty percent of the vendors scheduled to show at the trade event have pulled out it seems that Reed underestimated the importance of Modern Sporting Rifle. On top of that, the majority of the celebrities who were scheduled to appear at the event also pulled out, leaving Reed Exhibitions with a pretty lack luster show. On Tuesday January 23rd the NRA announced that they were pulling sponsorship for the Eastern Sports and Outdoor Show event as a result of Reed Exhibitions stance. Maintenance of AR platform guns will be more important than ever with the likely changes in the laws headed our way. 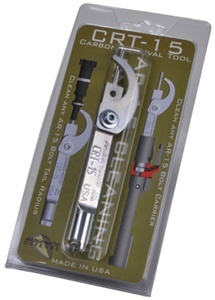 For the Soldier, enthusiast, gunsmith, or armorer here is a single tool that can remove the carbon from both the bolt tail and bolt carrier with such ease and precision. I can’t think of a faster way to clean these parts. This tool outstrips the function of the “scraper style” tools currently in the industry by not only improving on their ability to remove carbon buildup in the bolt carrier, but surpassing them by adding the feature of quickly and accurately removing carbon buildup from the tail of the bolt. Solvent and a wire brush will do the job of cleaning the tail of the bolt, but it takes more time and effort than is necessary. The CRT-15 can remove carbon properly from any bolt tail radius, (bolt tail dimensions vary between manufacturers). The CRT-15 is the must have cleaning tool for the owner of and AR-15 platform gun. Are AR-15 Rifles soon to be a thing of the past? Prior to the Sandy Hook tragedy, Colt was planning to introduce 7 new AR variants at the SHOT Show in January of 2013. High Standard was prepared to bring several models of AR rifles to the market as well. 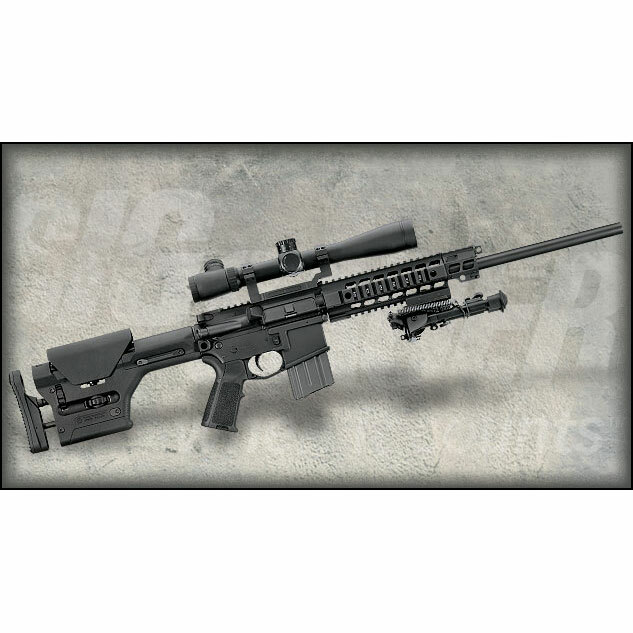 Nosler was scheduled to introduce the Varmageddon Rifle, an AR variant for varmint hunting. Remington had a new R-15 rifle with several variations planned for release. Sig Sauer has the 516 PRM and Sig 400 Predator rifle with new options. Undoubtedly there are many more such rifles and carbines that were planned for release to the market for 2013. I suspect that some of these makers will have already pulled these new offerings from the show. Why, because they have already used up all the parts they have on hand to make and sell current models. The handwriting is on the wall, there will be some heavy new restrictions on semi-autos soon… barring a miracle. The AR market has been hot for years now. Part of the reason for this is because veterans come home and want to own the rifle that they trained on in the military. Since Vets cannot get an M16 or M4 in civilian life, they opt for the AR-15 because is looks similar and has similar handling characteristics. This habit of wanting the gun you trained with has been common since time in memorial. Then Hollywood helps build interest in certain guns as well. It will be interesting to see what new laws are around the corner and how it will effect the manufacturing business. In my local area there are several manufacturers who build either AR parts or complete guns. So they will be forced, in all likelihood, to move on to other guns, or perhaps out of the gun business altogether. A bigger concern is that these new laws will be job killers, and it is almost certain that they will cause lay-offs as companies scramble to revamp their offerings. Oh well, if common sense were common, more people would have it. Update, for those of you who do not know it, NO AR-15 was used at Sandy Hook.